The Vishwanath Mandir is the pulse of Varanasi. It is considered to be the most auspicious place in the city where religious rituals and festivals rule most part of the day. The temple is dedicated to Lord Shiva and is regarded as one among the twelve holy temples of India. Even today the age of the temple is not estimated accurately as it has been subject to continuous Mughal invasion and subsequent war assaults. The present temple complex has been resurrected due to the efforts of the denizens who rebuilt each time it was destroyed. The Bharat Kala Bhavan is one of the oldest educational centers in India. It is located inside the Banaras Hindu University and is divided into various sections like the Mahamana Malviya Gallery (in honor of the founder), Archaeological Gallery, Nicholas Roerich Gallery, Nidhi Gallery, each of which houses various artifacts and relics related to Indian history. Mughal paintings, miniatures and Buddhist sculptures are also exhibited inside the museum. Located close to the BHU are a good number of hotel in Varanasi with immediate access to most landmarks. 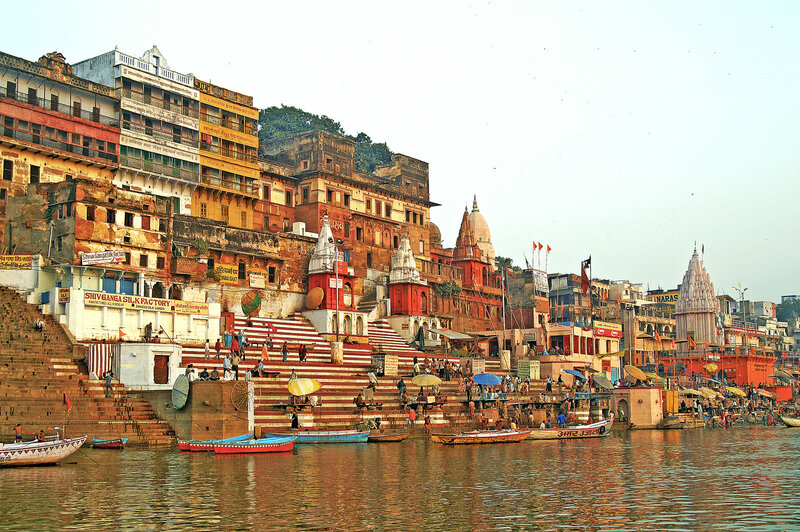 Located on the confluence of the Asi Rivers and the Holy Ganga, the Assi Ghat is one of the most renowned locations in Varanasi. It is located on the far south of the city and is the place where pilgrims conduct ablutions before submitting prayers to their deities. The Ghat is an important landmark that is used to portray the city in almost all documentaries, photographs and other depictions. The Ghat is found to be mentioned in various ancient Hindu Vedic texts like Agni Purana, Kurma Purana, Matsya Purana, pasha Khanda, etc. Built by Maharaja Balwant Singh in the eighteen century, the Ramagar Fort now houses a museum where the royal artifacts are placed for public display. The noted attraction of the Fort is the “Durbar Hall” or meeting place which was a common feature of all Indian palaces. The Hall was used for conducting public meetings where major governing decisions and public policies were formed. The Fort has within its vicinity a temple dedicated to the Hindu sage Veda Vyas the author of the epic – Ramayana. 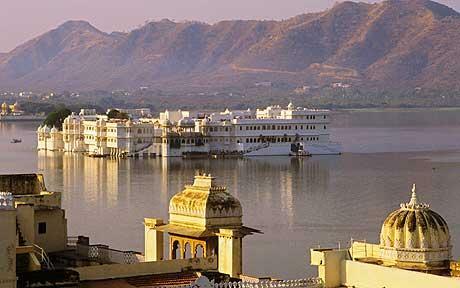 Udaipur, the princely state in Rajasthan is home to some of the finest palaces, forts and manmade lakes in India. The city has been a seat of power to the Mewar dynasty and also to some of the Mughal emperors who were captivated by its natural surroundings and pleasant climate. There many 5 star hotels in Udaipur where accommodation and tourist arrangements can be made easily well in advance through the internet. The thrill and rush of sped boating at Fateh Sagar Lake is never to be missed during a visit to Udaipur. The speed boat services are functional throughout the year. Visitors can choose from long distance cruises to dizzying spins and feel the adrenaline shoot up their spine onto their brains. A normal sized speed boat can carry up to ten people in a single trip. Hathi Pole is one of the most noted local market places in Udaipur where handicrafts, handmade by native artisans, are kept for display and sale. Clay puppets, folk arts, colorfully designed artworks, embroidered clothes and Rajasthani miniature Paintings are available at fair places in this popular market place. Rajasthani Miniature Paintings are noted artwork of the region, which is created by skilled locals who have been imparted the technique from their previous generations. The market place is fairly spacious and is pleasant to walk exploring the roadside shops. The seven water bodies of Udaipur are often referred to as Seven Sisters. Udaipur’s seven sisters are Pichola, Govardhan Sagar, Dudh Talai, Rangsagar, Kumaria Talav, Fateh Sagar and Swaroop Sagar. These water bodies have been enriching the soil and the livelihood of the natives since time immemorial. They have been providing the necessary water supply for irrigation as well as for life sustenance and hence are revered by the denizens. These beautiful water bodies, some of which are manmade are a must visit during a visit to the city. The Bagore-ki-Haveli is an eighteenth century mansion that is built on the banks of Lake Pichola in the Gangori Ghat region. It was built by Amir Chand Badwa, the then Prime Minister of Mewar region. The Haveli has a staggering one hundred and thirty eight rooms and houses a good number of cultural artworks and displays created by local artisans using traditional techniques. There is no cuisine in the world that is so vivid in taste as well as colors as a Rajasthani Thali. A typical Rajasthani Thali will feature a double digit number of dishes in small quantities arranged in a circular fashion in a large plate. Missing a Rajasthani thali can be the most unfortunate thing in a visit to Udaipur. Many of the 5 star hotels in Udaipur also serve Rajasthani Thali as the main course during the day. The Viceregal Lodge: The Viceregal Lodge was built in 1888 under the monitoring of Lord Dufferin to be used as the British-Raj Palace. Today it houses the Institute of Advanced Studies and is known by the name of Rashtrapati Niwas. The building which is an imposing structure over the hills of Shimla is one of the most picturesque locations in the city. Built in the Jacobean architectural style the building depicts the Renaissance revival of English architecture and is of great interest for those interested in art and architecture. Kuthar Fort: Standing strong for more than eight hundred years, the Kuthar Fort is one of the oldest forts in the Solan region. The Fort is set amidst beautiful lush green nature and once is said to have had in its interiors sprouting water fountains which attracted most visitors of Shimla to the Fort. Gaiety Heritage Cultural Complex: The complex is a Gothic style building that is a standing memoir to the Victorian style of architecture. Located in what is called the Mall Road today, the cultural complex was built some 122 years back and is a place of attraction for architecture buffs and historians. The Mall road being a city center is also where most Shimla hotel booking can be found. Shimla Glen: A serene picnic spot within the city borders. The glen region is surrounded by deodars that climb onto to the hill side and pines that stand erect. There is no better place in Shimla where greenery can be enjoyed at its best. The closely located Chadwick Falls also attracts a good number of tourists to this place which becomes bustling with activity during the tourist season. The Shimla Glen is home to some of the exotic birds and insects that can excite any biologist or nature watcher. Observatory Hill or The Institute of Advanced Studies: Tucked away in the western end of the city, away from all hustle and bustle the observatory hill is a great place to observe the natural splendor of Shimla in all its glory. It is regarded as one of the most influential research locations in India and was set up by the Ministry of Education in 1964. State Museum: There is no better place in the region where one can learn and know more about the history and tradition of Himachal Pradesh. The museum is located on the Mall Road and has various displays on cultural anthropology, art works and archaeology. The museum has an extensive collection of more than 10,000 artifacts collected from all over the State. Srinagar is nestled amidst mountains, valleys and flowing rivers that make it one of the most picturesque locations in the country. It has been a favorite for newlyweds and movie makers who are never satisfied taking in the natural splendor of the city that is unadulterated by manmade means. A good number of 5 star hotels in Srinagar have become part of the landscape recently. The heavy tourist inflow is yet again going to increase their count. Dal Lake: Dal Lake is called the floating jewel of India. It indeed is a jewel that gives a picture perfect spot that cannot be missed during a travel to the city. In fact, it cannot be missed since most of the transportation within Srinagar will happen through manned boats that crisscross the surface of the Dal Lake. 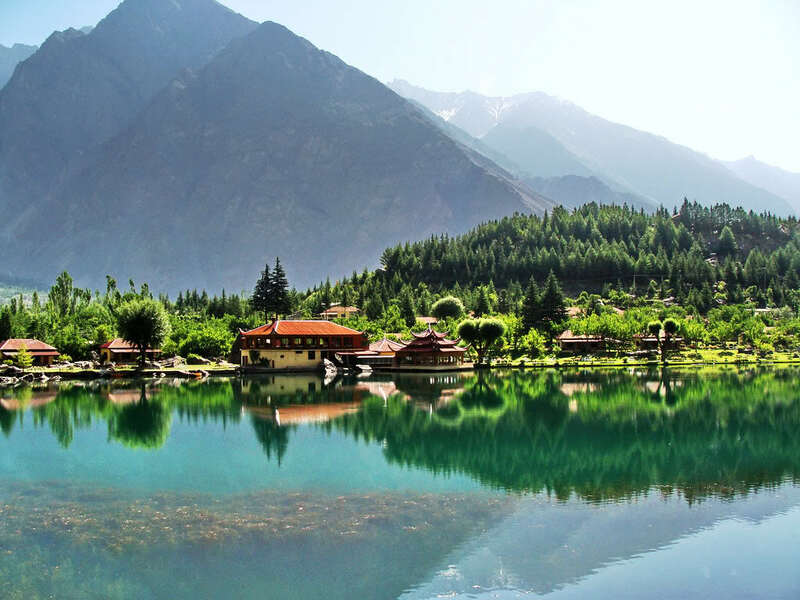 Flowing lazily amidst towering mountains and sloping valleys, it is perhaps the Dal Lake that completes the picture of Kashmir as a paradise on earth. Shalimar Bagh: Kashmir invokes romance in any hard heart and so it did in Mughal ruler Jahangir, who commissioned the Bagh for his love Noor Jehan late in the year 1619. The Bagh is made up of four terraces of chinars and water bodies that run their slow courses alongside. The Shalimar Bagh has a majestic view of a hill rising to the sky, which adds to the natural beauty and splendor of the place. The Bagh is open to visitors throughout the year and is a must see place in Himachal tourism. Nishat Bagh: The Nishat Bagh is literally a hillside excavation. The Bagh is carved out of a hillside and is terraced into twelve sections with the Mughal style of architecture. There is water channel that decorates the center column of the Bagh and adds to its mystic beauty similar to Taj Mahal, except at the end of the water channel it is the majestic mountains instead of a white marble monument. Harwan Garden: This enchanting garden located at Harwan village is a modern imitation of original Mughal gardens. The gardens are watered with the aid of a water reservoir that is located on the top hidden from public view. The Buddhist site of Harwan Vihara is located just a stone’s throw away from the gardens. It is said that the great Sage Nagarjuna visited this place and is said to have meditated before continuing his pilgrimage. Most of the best hotels in srinagar are closely located from the Harwan Garden. Shankaracharya temple: This temple is as much as close as one can get to spiritual ecstasy. 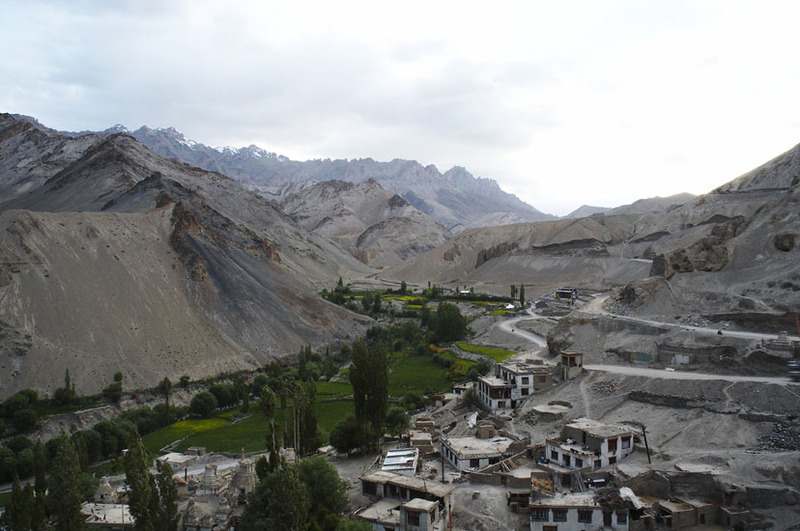 Located on the Shankaracharya Hill (also known as Takht-e-Suleiman), the temple is built at a ground level that is 1100 feet above surface level. Srinagar is the capital of Jammu & Kashmir. Located on the banks of the Jhelum River it has been a favorite summer resort for the British as well as the erstwhile Indian rulers who were wooed by its beauty. The place is often compared to as heaven on earth, which it literally is except for the occasional domestic violence that sprouts due to India-Pakistan divide. Dal Lake is what makes Srinagar a jewel in the Indian tourism contingent. Like a flat sheet of glass, the river spreads far and beyond reflecting on its surface the snow-capped mountains and the greenery that lies on the foothills. A visit to Srinagar without seeing the Dal Lake is incomplete. The Khanqah Shah-i-Hamadan is a Muslim religious place that has been built in the early eighteenth century. The monument is actually a meeting hall for Muslim prayers which with its beautiful exteriors and interiors can make one feel oblivious to religious borders and inspire to take a walk inside. However, access is allowed only to Muslims and non-Muslims are allowed to gaze at its beauty from the intricately designed windows which by themselves are beauty exemplified. Cruise around the beautiful Dal Lake in luxurious house boats. Being a city that is built around the city, a vast majority of citizens live in houseboats. There are exclusive house boats that function as mini-hotels with all amenities that assure a comfortable and relaxed stay in Kashmir. Do not miss out to stay in one of the boat 3 star hotels in Srinagar which cannot be seen anywhere else in the country or even the world. Srinagar is famous for its Shikara cruises. These cruises are basically small and beautiful boats manned by a single person which two to three people can be accommodated. In the city they are largely used as “floating gardens” a name given to flower shops that float around for selling flowers to visitors. A cruise in a Shikara boat will give a brief but beautiful glimpse into the lifestyle of Mir Bahris, a community of people who have grown besides the lake since ages. When in Srinagar, eat like a Kashmiri; with lots of cottage cheese, abundant use of meat, a splendor of vegetarian dishes and most importantly the goodness and sweetness of Indian desserts. Luxury hotels and resorts in Kashmir offer banquets, popularly known as wazwan where one can taste every dish at one’s own ease till one’s own fill. One can get authentic Kashmiri food in any hotel in Srinagar. Srinagar is home to the Royal Springs Golf Club considered to be one of the best in the whole of Asia. Strike some holes and savor the walking from one hole to another in this beautiful golf course designed by Robert Trent Jr.
Juhu is where more than half of the Mumbai head for a casual evening stroll. There is no better place in the cramped city where one can catch some breath and relax watching the lapping waves crashing at the golden sands. Situated in ‘Ville Parle’, Juhu beach is considered to be one of the most visited beaches in India. The beach has also been a favorite spot for film makers since the initial days of Indian cinema. The Southern end of the beach is home to the who’s who of Mumbai and also has rows of luxury hotels in Juhu that stand tall towering the cityscape. • The chill spray of the waves feels better with piping hot mouth watering food delicacies and snacks like Pav Bhaji, Pani Puri and bhel puri that are served by roadside vendors. While visiting Juhu do not miss out on tasting these dishes that have been satisfying the sudden food cravings of Indians since decades. There are also a good number of eateries and hotels in Juhu that’s serves local delicacies with the most authentic taste. • Beach is a place where sport is played with much enthusiasm. The Gandhi Gram located on the northern end of Juhu beach is a popular place for kids to spend time playing basketball, football, cricket and such outdoor games. • Horse riders can be spotted in most of the Indian beaches. Juhu is more special since the beach has camel rides as well as dancing monkeys adding to the entertainment quotient of the beach. • Juhu beach probably has the best setting in India apt for a morning walk or casual jogging. One can spot a good number of celebrities and actors jogging in track suits with their pet dogs in the early mornings. There are also yoga sessions and personal exercise groups that make the beach a social gathering place in Mumbai. • The beach is bordered by statues of Indian leaders who have fought for its freedom and have contributed to its progress. These statues are maintained by the local corporation which aid in remembering the past history and the sufferings that Indians had to undergo to achieve freedom. • Getting drenched in the rains might seem to be a bizarre thing to do at home. Juhu beach is most beautiful in monsoons. Getting wet in the pelting showers is quite an experience that is never to be missed. The beach during the monsoon has been a favorite shot for many directors who have used it again and again in a good number of India movies. • What more can be more relaxing and serene than sitting and watching the evening sun dipping into the distant horizon? Juhu beach is mostly visited by locals only to savor this natural vista which lifts off all worries and stress of daily life. The word Agra just reminds us of one of the Seven Wonders of the World “Taj Mahal”. It is the most widely visited locations here and a trip is considered incomplete without being photographed in front of this famous monument. The city is located on the bank of the Yamuna. The Agra Fort, Fatehpur Sikri as well as the Taj Mahal come under the UNESCO World Heritage Sites. Agra has been visited by an enormous number of tourists all-round the year. The Mughal capital, situated in the north Indian state of Uttar Pradesh forms a Golden triangle of Indian tourism along with Delhi and Jaipur. The city is connected to all prime places by rails, roads and air. There are auto rickshaws, buses and locals cabs available for tourist transportation. The city is a great example of Indian art and culture. It mirrors the talent of Indian population during the grand past. The city has a unique style of traditional paintings, folk dances, folk music and embroideries. The hotels range from home stays and budget hotels to luxury ones. Best hotels in Agra include all facilities including a pick up and drop from the airport or railway station. They provide with all the facilities including a packaged tour to all the popular locations. Hotels are widely scattered all around the Taj Mahal showcasing direct view from their interior parts. October to march is considered as the best time to enjoy in Agra. The weather is pleasant and good for sightseeing. It is full of monuments and historical structures. Also, museums showcase the Indian history. For shoppers, the city is full of rare collection of handicrafts and beautifully carved marbles. Valuable leather items like shoes, belts and bags are also worth investing. Exquisite jewelry and embroidery works can also be found here. Brassware and carpets available here are renowned all over the world. The top five places to be visited apart from TajMahal includes Agra Fort,which is a huge semicircular shaped structure constructed out of red sandstone, Itmad-ud-Daula which has precious stones embedded on its marble walls, FathehpurSikri, which flaunts the Mughal architecture, the elaborately adorned Akar’s tomb, the religious Jama Masjid and the holy and pearl white Moti Masjid. The MehtabBagh and the MehranBagh are also a must visit for their view and environment. The city is also popular for its delicacies like pedas, gajak and pethas. These are Indian traditional sweets which are famous all over the country. Some of them are included in the dessert section of the best hotels of Agra.Also the Mughlai cuisine here is worth a try as it is different from the ones available in other parts of India. The city has wonderful wonders and represents Indian history beautifully.